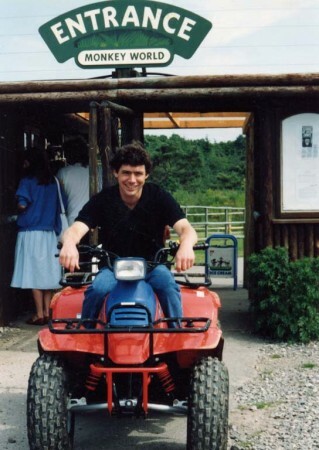 Jim opened Monkey World on 7 August 1987, having previously worked as a primate keeper. He had read about the plight of chimpanzees that had been poached from the wild and were sold on the black market to be used as beach photographer’s props in Spain. At that time a British couple, Simon and Peggy Templer (pictured below), were taking in young chimpanzees that had been confiscated by the Spanish authorities, but there were many more working chimps and they were all going to grow up into large, dangerous, wild animals. Jim wanted to help and this is when the idea of Monkey World was hatched. 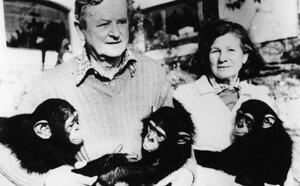 Jim became close friends with the Templers and told the Spanish authorities that, if they continued to confiscate the illegal chimps, he would build a sanctuary to care for them all. Having secured a small business loan, Jim approached Jeremy Keeling to work with him to rescue and rehabilitate chimpanzees. Most people thought it would never work – it would cost too much and the apes would be too abused and crazy to rehabilitate – but Jim had a mission. When the park first opened the site was desolate, having been used as a pig farm many years prior. From the beginning, Jim knew that the park and it’s mission would be embraced by visitors if they knew what he was trying to achieve. Expanding the rescue operations, designing and building new facilities for the monkeys and apes, and encouraging others to join him in his mission in those early days, was made possible with Jeremy caring for the new arrivals.